Distributed in the UK by Goldfish & Bison, Laser Pegs are LED components that take construction toys to a whole new level. Simply clip one to another and connect to a battery or mains transformer, and the different shaped pieces light up, each one being fed the power from its neighbour. 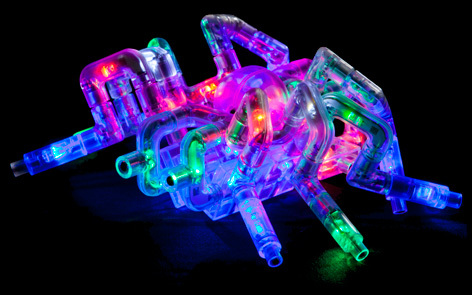 These unique Laser Pegs toys come in a great variety of shapes and sizes and even have pieces that can be constructed into wheels. The makers, Capriola Corporation, reckon that each LED piece will keep illuminated for up to 100,000 hours – that equates to 11 years of continuous illumination! The assorted Laser Peg shapes contain straights, squares, T-junctions, right angles, elbows and round sections that are capable of making almost any conceivable vehicle or building. A variety of Laser Pegs kits are available in different sizes to suit all budgets, and users can be assured that any extra pieces they buy are fully compatible with each other. The 3D Lite Board lets kids make almost any shape that comes into their heads, from Christmas trees to monsters, and every piece will light up at the flick of a switch! Every so often an innovative toy comes along that almost recreates a whole category, and Laser Pegs do just that to the construction toy sector. 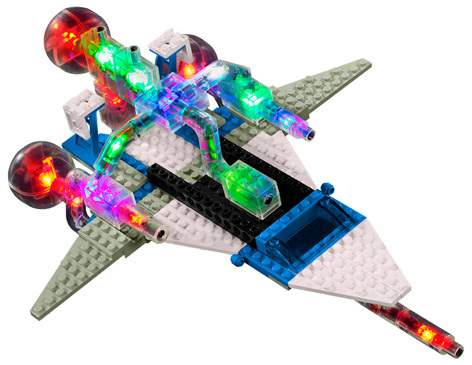 Whilst the models may not have the sophistication or detail of a Lego or Meccano set, the appeal to kids of having a fully lit toy that’s safe and long lasting is a great attraction. It was no surprise when Laser Pegs announced an app to enable kids to design their models on a tablet or PC screen, and then build from there. At the same time they revealed new building elements that are compatible with other leading brands, including items like wheels and other new shapes. Kids can share their designs through Facebook or Twitter, and have fun learning about new geometric patterns with almost limitless possibilities.